Uber Exec: "I Want White Men to Look Around in Their Office And Say, 'Oh Look, There's a Lot of White Men Here, Let's Change This'"
Uber's chief brand officer Bozoma Saint John told CNN on Sunday that she wants white men to recognize that a bunch of white guys working together in an office is a problem which they need to fix. 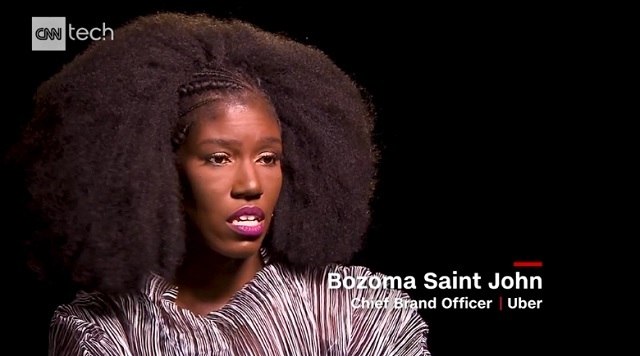 Bozoma Saint John, Uber's chief brand officer, called on white men to help diversify their workplaces. "I want white men to look around in their office and say, 'Oh look, there's a lot of white men here. Let's change this.'" "I want white men to look around in their office and say, 'Oh look, there's a lot of white men here. Let's change this,'" Saint John said at the SXSW festival on Sunday. Saint John said the onus should not be on people of color to improve diversity at work: "Why do I � as the black woman � have to fix that? There's 50 of you, there's one of me. Ya'll fix it. ... Everybody else needs to make the noise � I want white men to make the noise." Wait, I thought white people weren't supposed to act as "white saviors"? Also, as men, aren't they not supposed to treat women as "damsels in distress" needing to be saved? Hahahah there�re not a lot of white men where I�ve worked and I need more white men. How about white men look around and assess whether Merit was used for hiring and promotions! ?